How Much Does On-Hook Insurance Cost On Average? Save big by letting three agents compete for your on hook towing insurance! On-hook coverage is the portion of your commercial towing insurance that protects your business against damage done to others’ vehicles when they’re hooked up to one of your tow trucks. On-hook insurance almost always comes bundled with your business auto liability insurance and makes up a significant portion of your overall insurance costs. A tow truck owner can expect to pay, on average, between $350 and $800 a month for their commercial auto insurance, including on-hook coverage. Where can I find cheap on-hook insurance? There is no set price for on-hook towing insurance. Different factors contribute to your final price. What is the nature of your business? How many tow trucks do you own? What type of tow trucks do you own? What are their years, makes, and models? What sorts of vehicles do you tow? Insurance companies look at this information to determine how much to charge you. But different insurance companies weigh this information differently. The trick is finding the company that sees your company as a safe bet. 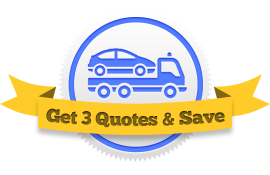 The best way to wade through all the different towing insurance companies is to use an online quote request form like the one we provide here. After you fill out one form, we connect you with three different insurance agents who each assemble a quote for your business. You can compare their offers and determine for yourself which company is best for you. How much should my limit be? A major determiner in the cost of your towing insurance is the limits you choose to select. On-hook towing insurance can have a limit anywhere from $10,000 to 250,000. The lower your limit, the less you pay. If you only tow low-valued vehicles, a $10,000 limit might be your best option. Most towing businesses will want something a little higher, though. You don’t want to choose too low a limit, because if an accident happens causing damage past that limit, you’ll be stuck footing the remainder of the bill. Just like your limit, your deductible plays a big role in the cost of your on-hook coverage. Most deductibles are set at $500, but you can choose to raise it to $1000 or higher. This will reduce your premium by a few dollars each month. The best thing you can do to reduce the cost of your on-hook towing coverage is simply to stay safe. Don’t get into accidents. If you have drivers who work for you, make a point of training them safe driving procedures. There are training programs available online that help you teach good safety habits. Other than that, shop around. The more insurance companies you look at, the more likely you are to find a good deal.